Shortly after the release of the Billet RSX Shifter, K-Tuned started to receive several inquiries about making a similar shifter for the B and D series engines. K-Tuned remembered they made a prototype of this several years ago. So they got it out, made a few changes, and produced a couple more prototypes for testing and feedback purposes. Testing went very well and the response to their photos was also excellent so K-Tuned decided it was time to make this product available. The K-Tuned B & D Series Shifter was designed with full adjustability in mind. The shifter pivot ball is height adjustable, shifter height is adjustable and the offset elbow of the shifter can be rotated to several different positions. The adjustable pivot ball allows the user to thread the pivot ball higher up on the shift rod to shorten shift throw if desired. Construction is as expected, only high quality materials are used to ensure the shifter will last. 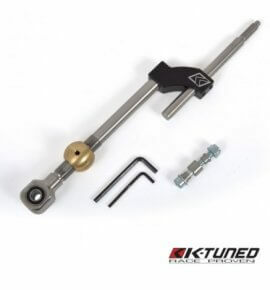 K-Tuned used 100% stainless steel with the lone exception being the offset elbow, which is made from billet aluminium. All hardware, spacers and allen keys for adjustment are included in our kit. 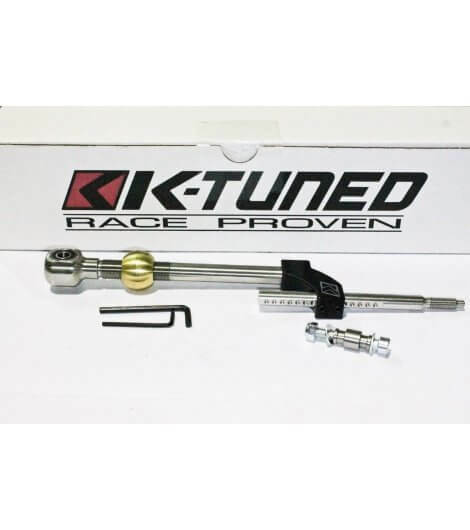 This is a great shifting upgrade for any B or D series engine setup.